In this week's Strong Towns podcast, Chuck Marohn expressed the frustration he felt with other advocates at the national Bike/Walk Summit. I share his frustration as I see people spending our scarce donations lobbying for a handful of millions of dollars that are swamped by the billions being spent on roads, parking and other anti-bike, anti-walk elements of sprawl. Chuck gives a great illustration of this in terms of Safe Routes to School funding, where advocates busted their asses to win tens of millions of dollars a year for the whole country, and then have to bust their asses all over again in every transportation bill and appropriations cycle just to maintain this funding, and maybe get a small increase if they’re lucky. Meanwhile, the government spent $14.6 billion on school construction in 2010, most of it building new unwalkable, unbikeable schools. Chuck’s response is to give up on the whole federal system and devolve spending to the states. If that’s what it takes I’m with him, but I want to at least try one more strategy before I endorse that. Here’s the strategy: go negative. Austerity for roads and parking. No more Mr. Nice Guy. No more "all of the above." 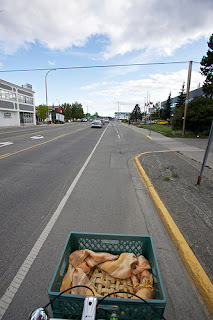 Urban pie transport: Photo: qousqous / Flickr. Imagine that your dad makes great pie, but you’ve got a selfish older sister who hogs the pie. It’s true, she’s bigger, but it’s still not fair for her to get almost all of the pie while you only get a tiny sliver. Every time your dad makes pie you plead with him and your sister for just a little bit more. Eventually your sister comes to you and says, "I’ll make a deal with you. Let’s get together and ask Dad to make a pie that’s twice as big. Then we’ll both get twice as much pie as we usually do!" So you do that, and it works, but the time after that she convinces your dad to only give you a little more than what you got before the pie was doubled. Still, it’s an increase, so you shouldn’t complain, right? Now imagine that this is a magical pie that makes everyone who eats it more persuasive. It has a side effect that it also makes them hungrier. So each time your sister gets most of the pie, she wants more and more, and she gets better and better at convincing your dad to give her more. Would you really want your sister to get any more than she gets now? Wouldn’t you want to cut back her share drastically? Finally, imagine that your sister is abusive, and each time she eats the pie she gets stronger, and beats up on not just you, but your mom and dad and the family dog too. Why would you want your sister to get any pie at all? This is the situation that bike, walk and transit advocates have gotten us into in Washington. Roads and parking are not just competing with pedestrian, bicycle and transit infrastructure; they steal users from those other modes and reduce their lobbying strength further. On top of that, they’re bad for our health, bad for our safety, bad for our security and bad for our sanity. Chuck has also shown that they’re bad for the fiscal health of our local, state and federal governments. In a way, the federal largesse is just as bad for transit as for highways. Projects are rigged to satisfy FTA criteria. Projects that don't really make sense get built. Projects that do make sense don't get built. In the analogy, maybe the answer has to be: learn how to make your own damn pie. LA, for example, passed a countywide sales tax to fund projects. Obviously, that's not quite as good as say, a property tax that captures the value-added of transit (like Marohn proposes). Some projects are getting federal money as well, but in some cases, the county decided to skip that so it could build the project it wanted when it wanted. Not playing with OPM has meant there is a real incentive to get return on the projects, and sure enough, the city is looking at upzoning around Expo Line stations.